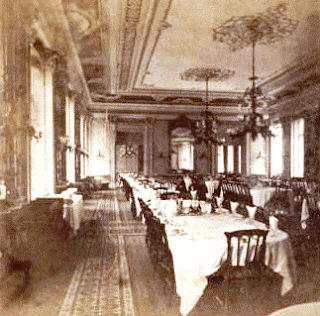 The hotel was not suggesting that its patrons have a romantic dinner in public, for that would have been unthinkable, even for married couples.2 Celebratory dinners of this kind were conducted within the prevailing customs and mores of the Victorian period. Still, the holiday was exceedingly popular. In 1882, the post office reported that it was busy delivering valentines cards until 11:30 PM, well past its normal 6:30 PM quitting time, even though it put extra carriers on duty that day.3 In concert with the mania for Valentine cards, the St. Nicholas Hotel had its special menu printed on expensive card stock showing cupid pulling a net from the sea. It was lithographed by De La Rue and Co., a British firm mostly known for making postage stamps and banknotes. 1. Saint Valentine (or Saint Valentinus) refers to one of at least three martyred saints of Ancient Rome. 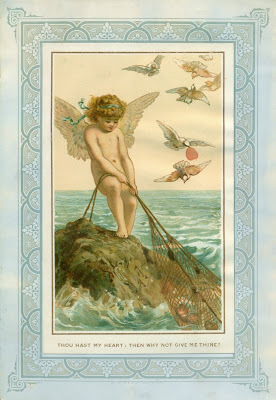 The feast of Saint Valentine was formerly celebrated on February 14 by the Roman Catholic Church until 1969. 2. An elaborate system of rules governing courting emerged after the Civil War. On a woman’s invitation, men conducted formal calls to her home, during which couples might converse, read aloud, or play parlor games. Parents provided privacy, often removing themselves from the parlor, trusting that genteel standards of propriety would guide behavior. Toward the end of the century, new opportunities for interacting outside the home emerged as college enrollments rose and more women entered the workforce. New public diversions in urban areas such as amusement parks, theaters, and restaurants eventually enticed courting couples away from the safety of their parlors. Paul Boyer, The Oxford Companion to United States History, 2001. 3. New York Times, 15 February 1882. 4. 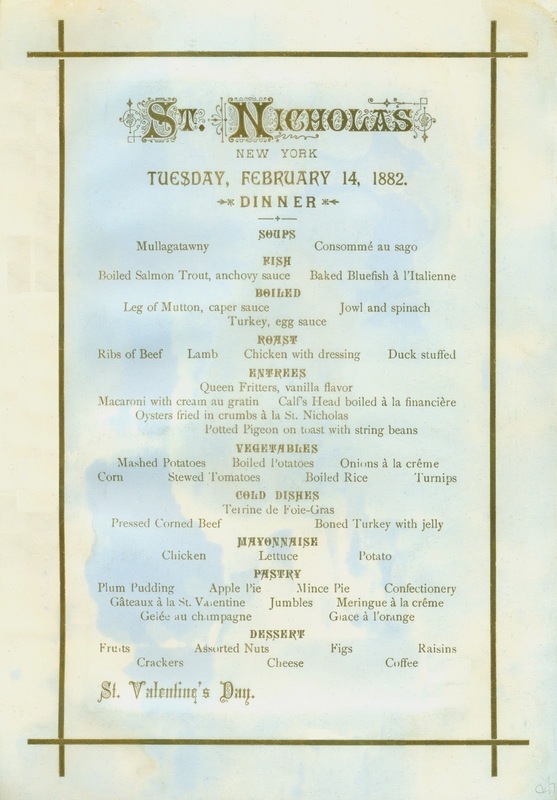 Charles Dickens gave a reading from his new novel David Copperfield at Steinway Hall on 14th Street at 8:00 PM on 31 December 1867. 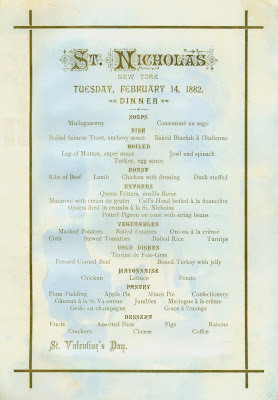 The next day Twain called on Olivia Langdon at the St. Nicholas, where she was staying with her family. The first of thirty-four New Year’s Day calls that he planned to make on friends, he decided to cancel the remaining thirty-three so that he could spend the entire day with her. So very interesting! Thanks and Happy Valentine's Day!